The pan and zoom functionality in Biodiverse has always been pretty simple. For the zooming you simply click the button and the display zooms in. The same applies to zooming out. The problem here is that it is not consistent with other software. The other issue was that each panel (the map, tree and matrix) had its own pan and zoom tools, leading to repetition and needless use of screen real estate. In some cases there was not enough space to render the control widgets so they simply disappeared. This is all changed in version 1. Now all of the pan and zoom functions are at the left of the window, with one set of tools controlling all the panels (much of the display functionality has also moved). 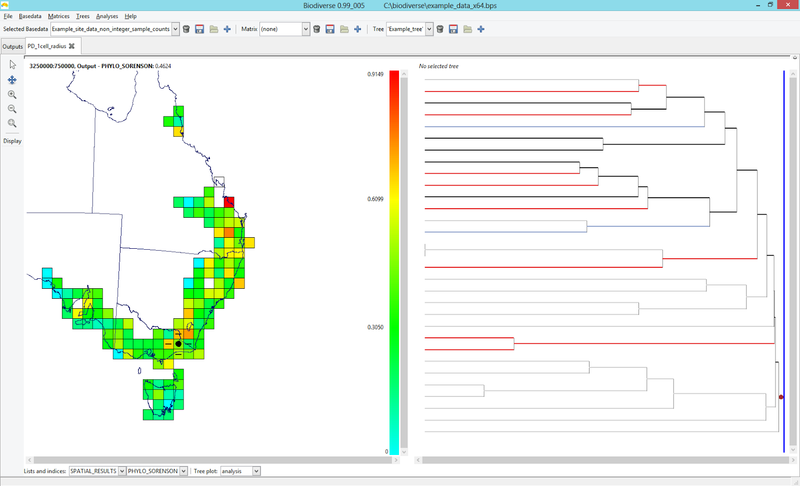 This applies to all of the analysis displays, so the View Labels tab and all the Spatial, Cluster, Region Grower and Matrix analyses. Compare the new version with the older version in the screenshots below. The interface is now much cleaner and less repetitive. 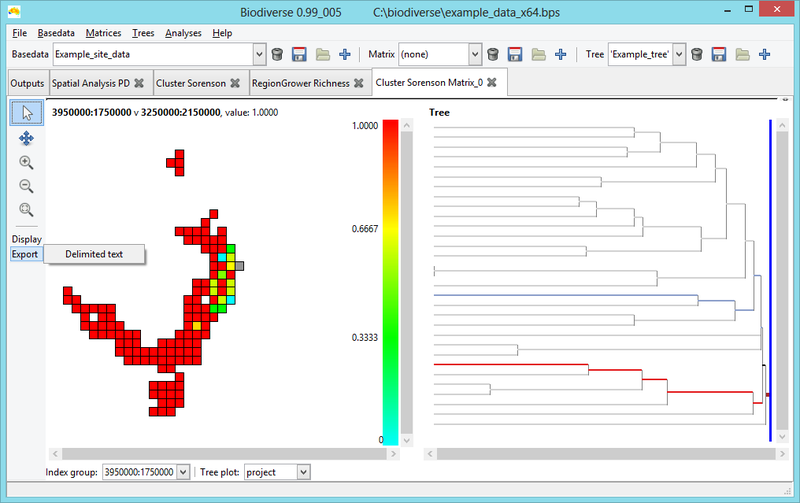 The new versions of Biodiverse have the pan and zoom tools are at the left of the display, and one set controls all the panels. The old approach had pan and zoom tools for each of the panels, so there were three different sets for the view labels tab. The new approach also has keyboard shortcuts to switch from one mode to another: “z” to zoom in; “x” to zoom out; “c” to pan; “v” to zoom to fit and “b” to select. There are tooltips for each button so you can get a reminder of the key to use by hovering the mouse over a tool. The zoom-to-fit and zoom-out options happen immediately the key is pressed to speed up the interaction with the display. Their keyboard shortcuts also don’t change the current mouse function, so if you are selecting then you can keep doing so. The zoom-in option now supports a box zoom approach, where one can select a box and it becomes the focus of the display. A single click will zoom in by a predefined amount (usually x1.5 or x2). (The matrix in the View Labels tabs needs some work before version 1 is released [Update 19-Nov-2014 - this has now been fixed]). To make life easier for the user the mouse also changes its icon depending on which mode it is in, so there is a visual cue for the user. To be honest, there is nothing particularly novel about this approach. However, it can only be a good thing that the cognitive load on users is reduced by following a more standard approach for interaction with the plots. 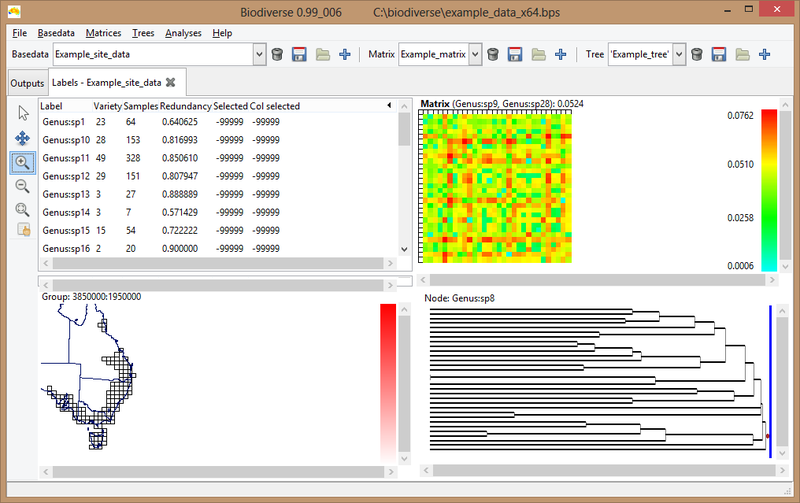 Exports in Biodiverse 0.19 and earlier all had to be done from the outputs tab. This meant that users had to switch from an analysis tab displaying the results of some calculations, which is a few too many mouse clicks to be described as easy. That’s now a thing of the past. In Biodiverse 1.0 there is now an export menu at the left of the tab when the map is visible. This is in all tabs which have a map: spatial analyses, spatial matrix plots, and cluster and region grower analyses. As part of adding this functionality, the system now also defaults to the last list that was displayed if the export supports lists. When you export your data from an open tab it will choose the one you are looking at as the default. This applies to exporting from the Outputs tab as well, so you can still export the data you were looking at if you have closed the analysis tab or don’t want to navigate back to it. The default list is the last one displayed. 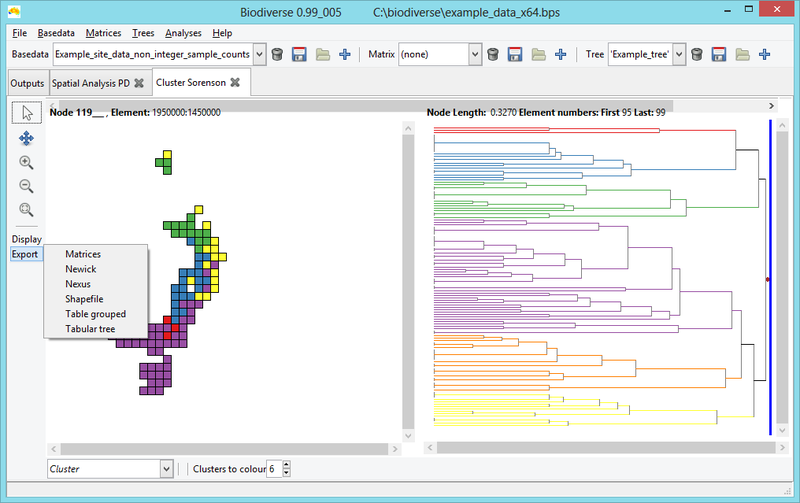 Biodiverse has always had the capacity to display a phylogeny at the same time as one views the spatial data. 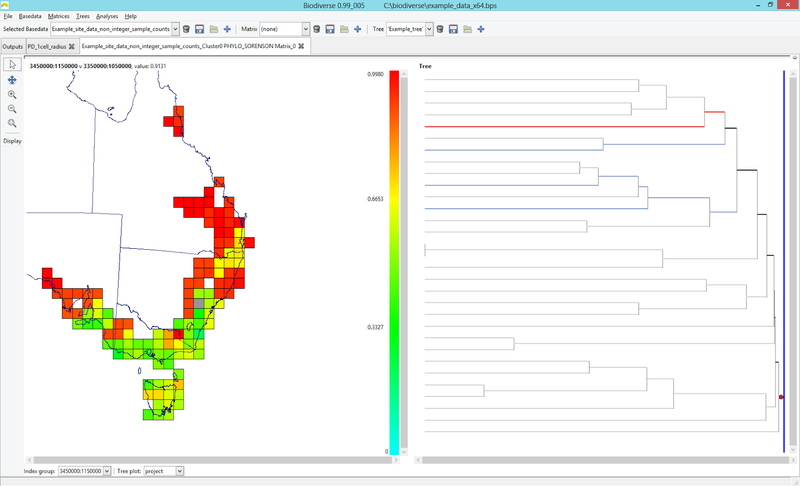 In version 1 it now has the capacity to display a tree at the same time as a spatial analysis. Now when you run an analysis using a tree you can display the results and more easily see which branches of the tree contributed to the answer at that cell. If your analysis did not use the tree then you can still see which branches occur in a cell (group) and its neighbourhood. 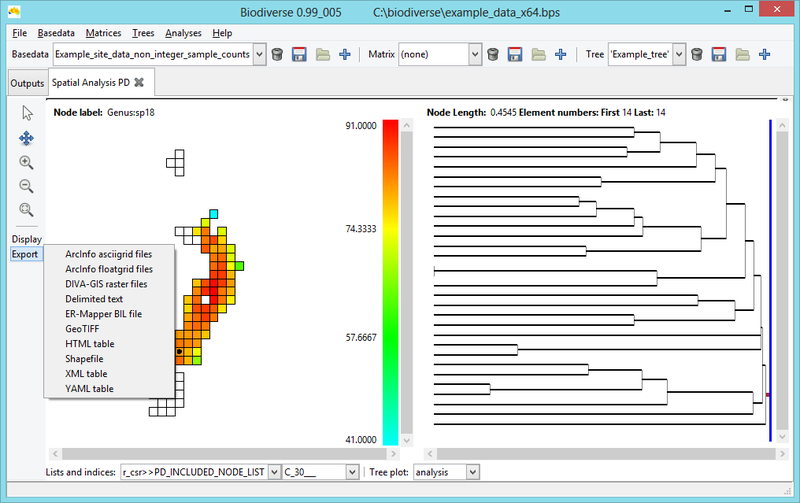 The screenshot below is the example data distributed with Biodiverse, analysed using one cell radius neighbourhood to calculate the PhyloSørenson index of turnover between the branches in the central group (cell) and each group within a one cell radius. Branches plotted in blue are found only in the central group (neighbour set 1, and the blue should probably be darker), those in red are found only in the neighbouring groups (neighbour set 2), while those in black are found in both neighbour sets. Any branch not found in the neighbourhood is in grey to reduce its visual impact without hiding it. As with the View Labels plots which have been in Biodiverse since the beginning, the branch highlighting updates as you hover the mouse over the map. The new tree plot is not restricted to the spatial analyses. You can also visualise matrices in the same way. The next screenshot is the PhyloSørenson turnover surface for an index group plotted in grey (see Laffan 2011 for more details about how this process works and is interactive). Now the branches highlighted are those in the index cell relative to a set in the cell that was hovered over when the screenshot was taken (perhaps we need to highlight that in a future version). The interpretation is otherwise the same as the previous plot – blue branches are unique to the index group, red are unique to the neighbour group, and black are shared. The other good news here is that you are not restricted to using only the tree used in the analysis. 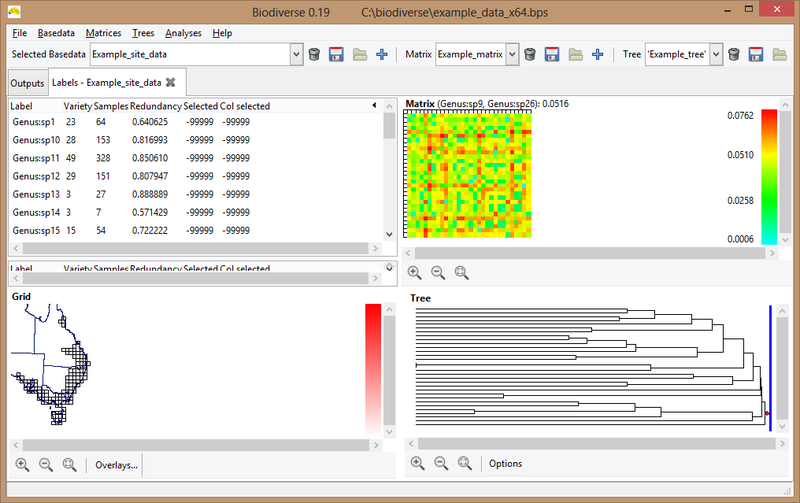 Using the chooser at the bottom of the window you can select from the analysis tree, the currently selected project tree, or no tree at all. As of version 0.99_005 you can also hide the panel if it gets in the way. We don’t yet plot extra trees in the cluster plots, but if there is sufficient need then we could be convinced to implement it. Current users of Biodiverse will also note that the display layout has changed. That will be the topic of another post.